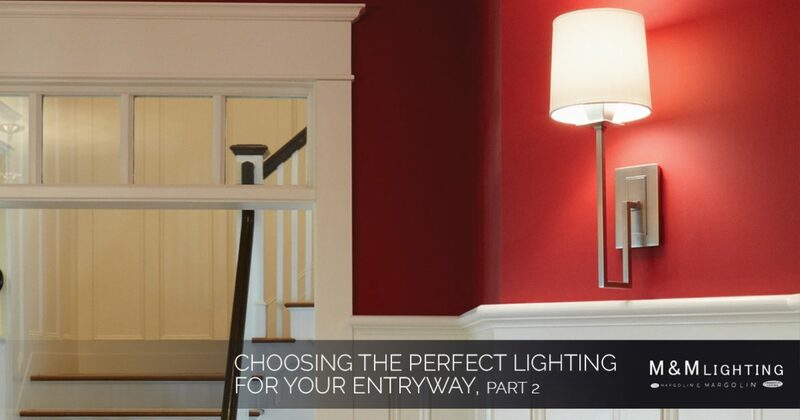 Light fixtures can go a long way towards improving the decor and functionality of your home’s entryway. In part one of this series, we discussed the benefits of installing chandeliers and pendant lighting. In part two, we’ll take a closer look at wall sconces and lamps and the benefits of each of these lighting solutions. If you need assistance choosing the best light fixtures for your home, contact the professionals at M&M Lighting today. We offer a high quality selection of chandeliers, lamps, pendant lighting, and recessed lighting, and we would love to help you on your lighting journey. Traditional Wall Sconces – This style of light fixture often features ornate detailing, reflecting lighting styles of the past. Their formal appearance will add elegance to any room in your home, especially when it comes to your entryway. Modern Wall Sconces – As their name suggests, modern wall sconces have a simple and sleek feel. This type of light fixture tends to blend best with modern or contemporary interiors. For a more minimalistic approach to your home’s interior design, consider picking up some modern wall sconces for your entryway today! Rustic Wall Sconces – If you live in a rustic or antique style home, rustic wall sconces can go a long way in improving your home’s entryway. These sconces offer distressed finishes, darker colors, and even animal motifs. This type of lighting can add a little bit of character to any room in your home. Armed Wall Sconces – If you’re looking for a way to make your entryway appear larger, armed wall sconces may be a great lighting solution for you. For a more muted glow, cast the light downward on the walls of your entryway. For optimal illumination, try casting the light upwards towards the ceiling. Swing Arm Sconces – A swing arm sconce is specifically created to give the homeowner flexibility. This type of sconce allows the user to position the light in an adjustable fashion, making it a great option for entryways and reading nooks. Flush Mount Sconces – If you’re looking for a way to provide general illumination in your entryway or foyer, you’ll love flush mount sconces. This type of sconce is mounted directly to the wall and they do not feature arms or extending designs. If your entryway is a unique shape or size, a floor lamp may be a great lighting option for your home. If you need assistance choosing the best lamp or lighting system for your home, contact the lighting professionals at M&M Lighting today. Arc Floor Lamps – Arc floor lamps are known to point downward, directing light to a specific focal point of the room. If your entryway features a couch or side table, placing an arc floor lamp near each piece is a great way to highlight your furniture. Torchiere Floor Lamps – This style of floor lamp takes their inspiration from old gaslights. At the top of their tall stem, there’s an inverted cone that diffuses light as it sends it up towards the ceiling. This is a great lighting design option for those looking to add ambient light to their entryway. These types of lamps can be found in a variety of styles and finishes to accommodate the interior design of your home. Modern Floor Lamps – If your home features a modern interior, a modern floor lamp can add tremendous value to your home’s entryway. This type of lamp often features sharp edges and angles that are aligned in a geometric shape. An easy complement to any contemporary interior, this is a great way to draw the attention of guests and visitors. Rustic Floor Lamps – Looking for a timeless light fixture that won’t break the bank? Consider investing in a rustic floor lamp for your home’s entryway. This is a great way to add a touch of coziness to a relaxed entryway. Tree Floor Lamps – A unique lighting option for any home, tree floor lamps feature two or more branches on a single stand. These branches are usually adjustable and their light bulbs can be turned on and off separately, providing an effective lighting solution for your entryway. Industrial Floor Lamps – A very popular lamp style among homeowners, industrial floor lamps can provide a rustic and functional lighting solution to any room in your home. For an added antique- and retro-touch, consider installing LED filament Edison bulbs in your industrial floor lamp. M&M Lighting is proud to be a leading provider of state-of-the-art lighting solutions for your home. Whether you’re looking for more efficient ways to illuminate your entryway or you need an expert opinion on outdoor lighting, we can handle all of your unique lighting needs. Browse our light fixtures online or contact us today to learn more!